A glass case displays an original Lady Bru bust and a wax orange blossom headpiece typical of the time. 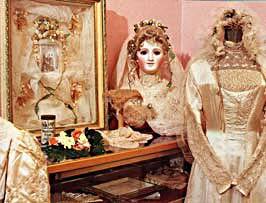 The rare bust, made in the 1880s by Bru, a famous French dollmaker, was discovered at a garage sale by a woman who lent it to a grateful Faulkner. Queen Victoria, the "patron saint" of Victorian brides, married her first cousin Albert in 1840 in a white satin gown. 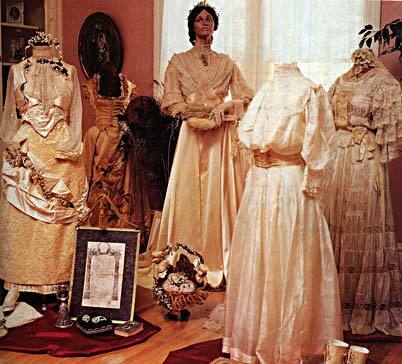 The main exhibit area is home to several gowns, including an 1885 gown (far left) worn by a Jewish woman who emigrated from Germany to Texas. It is accompanied by a single original shoe. Tradition held that the father of the bride gave the matching shoe to the groom, as a symbol of passing authority from himself to the new husband. The Victorian Bridal Museum filmed for TV movie. READ MORE. The Victorian Bridal Museum and La Boutique Consignment & Bridal has moved to a new location! We have relocated to the historic Old Hemet Opera House. The address is 146 North Harvard Street, Hemet, CA, 92543. For more information or to book a reservation for a tour, please contact Eve Faulkner (951)487-6088 or (951)255-4411 (cell). Remember, we're available for on-site showings and talks to make any occasion special. Read more about these special services.